OWAIN JONES was the star of the show as Steyning Cricket Club recorded a comprehensive win on Saturday. Jones finished with impressive figures of 7-28 from 12 overs as Glynde were skittled out for just 87 in 23 overs. Steyning made a poor start in response, falling to 57 for four, before they reached their target with six wickets in hand. Steyning skipper David Kennett felt his side’s bowling performance was special and said: “The performance with the ball was probably the best of the season from us. 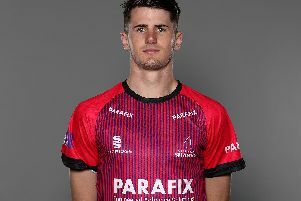 “Owain was tremendous with the ball and to take seven wickets was great for him. “We lost the toss but the way the match panned out, that did not prove to be a bad thing. “Our overseas player, Stephen Chimhamhiwa, supported him well and was fully deserving of his three wickets. “We made a sloppy start to our chase but, in the end, we won by a comfortable margin. Kennett lost the toss and his side were asked to have a bowl first up. They got off to a flying start as Jones dismissed openers Robert Mouland and Michael Warren, both for nought, to leave Glynde four for two. It did not get much better for the home side as they slipped to 39 for five. Darren Howard made 24 from 32 balls, while Charlie Hobden struck 12. George Burton-Durham finished unbeaten on 16 but that was not enough as Glynde were skittled out for 87. Jones was the stand-out performer with the ball with seven wickets and he was well supported by Chimhamhiwa, who took 3-33. Steyning would have been hoping to make a solid start with the bat. However, that was not to be the case as Ryan Matthews (six) and Christopher Barnett (one) fell early to leave them 11 for two. Hywel Jones then went soon afterwards for one as Steyning slipped to 24 for three. Oliver Collins went in and steadied the ship for his side with 24 to steer them closer to victory. After Collins fell, it was left to Ben Shelford and David Neale to see them home. Shelford finished unbeaten on 30, while Neale ended 17 not out as Steyning got home in 19.4 overs. Steyning host second-placed Crawley Eagles in the league on Saturday.